I am slightly obsessed with storage. If there is a container out there specifically for a certain item I MUST HAVE IT! I just love to have a tidy house (which is really hard working full time and having a 7 month old) and everything has its own place. We have this and it is huge! It doesn't take up a lot of room which is nice but the depth of this thing just keeps going and going. It holds a lot of stuff. It is awesome. I am actually going to be ordering some more of these suckers. Oh, to have a clean closet is just so dreamy. Look how nice and neat this one is. We have this too and it holds everything from clothes to wipes to toys. This is another must have. These would look very lovely in a living room. Simple but yet gets the job done and the toys off the floor. What little girl wouldn't love this in her room or playroom? Look at this! Boys can draw on the doors...hello! PERFECT! This is a cheaper storage option and its from Target. I LOVE PBK!!! Great storage options! Ahhhh! LOVE Those from The Land of Nod!! I'm headed over to look right now! Thanks! I usually get all of my basket type things from Target but lately I feel like they are just getting to expensive! Oh and TJ Maxx! Gotta love TJ's! i don't have the kids' toys storage issue yet - but i do love me some storage! true story - i used to save up my tiny allowance when i was a preteen - and go to target and buy bins and boxes. weirdo! but it's good to know we're not alone! I love to have things in their place and organized too! The house that we live in right now does not have a lot of storage space, so it forces me to cram stuff in closets! Well, now I cant stand the sight of the closets! So I am working on getting the closets organized! Not fun! 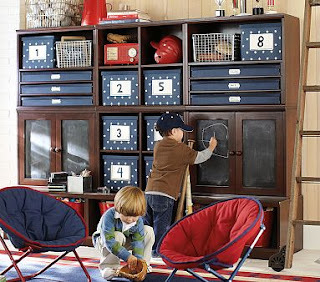 These are great options for storage solutions after baby arrives! I adore Land of Nod, Serena and Lily and PBK! !